This week, four celebrity casts match wits to raise money for their respective charities. In Game 1, it’s the Kardashian family (playing for The Dream Foundation) vs. Deion and Pilar Sanders’ family (playing for Sanders Claus). In Game 2, Tiki Barber’s family (playing for The Fresh Air Fund) vs. Ed McMahon’s family (playing for The Horatio Alger Association) face off. The two winning families from each respective game will compete against each other in the final round where one team will compete in the “fast money” round to win up to $50,000 for their charity. Tuesday, July 15, 8 p.m. This week, Bill Engvall (playing for the Brent Eley Foundation) and Larry the Cable Guy (playing for Arnold Palmer’s Children’s Hospital Orthopedics Division) go head-to-head, while Vivica A. Fox (playing for the American Red Cross) challenges Mo’Nique (playing for Crystal Stairs, Inc.). The two winning families from each respective game will battle each other in the final round, where one team will compete to win up to $50,000 for their charity. Family Feud goes Hollywood with an all-new celebrity edition of the classic game show, premiering Tuesday, June 24 at 8 p.m. ET/PT on “A”. Hosted by Al Roker, Celebrity Family Feud is a star-studded version of the beloved game show, only this time 24 famous families will face off and throw down for the charity of their choice. 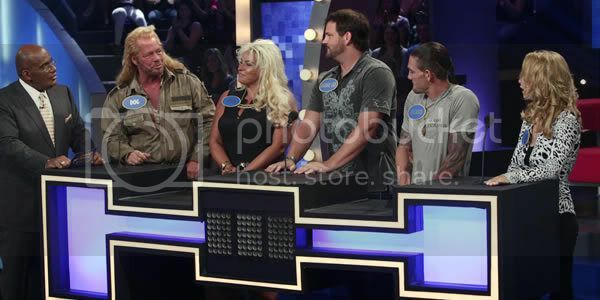 Former TV Queen Kathy-Lee Gifford goes head-to-head with Dog the Bounty Hunter, the casts of My Name is Earl and The Office fight for first place and Deion Sanders tries to keep up with the Kardashians. Each week, four celebrity families – either real-life or television families – match wits to raise money for their respective charities. Two teams compete against each other, with the winner from preliminary rounds going to the finals, where they can win up to $50,000 for their charity. In the premiere episode, rapper/actor Ice T and his family challenge Joan and Melissa Rivers and family, then singer/actress Raven-Symone and family squares off against Wayne Newton and family. * Cast members from The Office vs. the American Gladiators.